Well, folks, at the ride tonight we decided that Monday is high time for a killer ride. 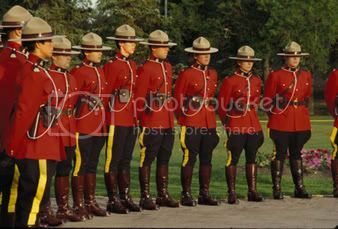 SO, the Royal Canadian Moped Posse would like to summon you all to the RCMP Labour Day R.I.D.E. Program. We will meet at 3 o'clock in the afternoon on Monday, September 5th at Dundas Square. We will then proceed to make a spectacle of ourselves, swarm down Yonge Street and spend the day cruising the Lakeshore. Any moped riders are welcome to come out and join us, so all you GTA and surrounding area folks, get off your asses and participate in the RCMP's Labour Day R.I.D.E. Program. yeah, it'd be great to get a lot of people out for this one! we're hoping we can get some out of towners to join us. The guys at Mr. Moped said they would try to link to us and mention the ride on their site. They might pass the word along to the Oakville riders they know too! Let's hope for a really rockin' ride! The corner of Yonge & Dundas. I guess whenever one is scheduled... Should be one next weekend, actually!